When we look back over the career of the late Wes Craven, what sort of things come to mind? Horror films, obviously, and often horror films which dealt with metaphysical ideas, such as dreams. The stories in his films where often fantastic and dark, but no matter how dark they were, they usually included a dose of humor. And, Craven was clearly somewhere who knew how to change with the times, as he had hits covering a span of four decades. And yet, when we compare Craven to his contemporaries like John Carpenter and Sam Raimi, do we automatically think of him as a gifted visual stylish? Probably not, but when you examine his filmography, you'll see that each of his movies has at least one iconic image. And never did Craven get more creative with the visuals than in The Serpent and the Rainbow. As The Serpent and the Rainbow opens, Dr. Dennis Alan (Bill Pullman), an anthropologist who is known for going on daring expeditions in foreign countries, is recruited by Andrew Cassedy (Paul Guilfoyle) to travel to Haiti to look for a drug who can give victims the appearance of being deceased. Alan arrives in Haiti, which is a morass of political and military issues, and meets with Dr. Marielle Duchamp (Cathy Tyson), who has worked with these so-called "zombies". She introduces him to local witch-doctor Lucien Celine (Paul Winfield), who, in turn, links Alan with Louis Mozart (Brent Jennings), a man who can supposedly supply the drug. However, local law enforcement officer Peytraud (Zakes Mokae), who also practices black magic, gets wind of Dr. Alan's quest and decides to use the forces of darkness to remove this man from his country. The Serpent and the Rainbow is "inspired" by a non-fiction book by Dr. Wade Davis, an anthropologist and ethnobotanist who traveled to Haiti in the 1980s to find a drug which supposedly caused patients to have the appearance of a corpse. These individuals could be revived and, due to the cultural beliefs in Haiti, were viewed as "zombies". And that's where the similarities between the book and the movie end. It's pretty clear that those with the rights to the book had the choice of making something which would have resembled a documentary or something which took the book's core idea and then went completely bonkers with it. Apparently, we got the latter. What do you expect when you take a story like this and place it in the hands of Wes Craven? It's actually what you should expect for it to be. Even before Dr. Alan gets to Haiti, we are treated to a very trippy scene which is simply a sneak preview of things to come. When Alan arrives in Haiti, the movie almost seems normal for a few scenes, as he visits the medical center and watches a tourist show at a nightclub. But, once he begins his search for the "zombie" powder, the movie spirals further and further into Wes Craven territory. As The Serpent and the Rainbow progresses, it drifts away from the source material and enters the world of the supernatural. Even though it keeps one foot in reality with things like the Tonton Macoute and the Haitian revolution, but the bulk of the film has no interest in reality. The bulk of the second half of the film does everything that it can to remind us that Craven made A Nightmare on Elm Street. As Alan goes further and further into the world of voodoo, things become more and more dreamlike. This is where Craven won't let us forget that he does have a strong visual sense. The coffin full of blood, the corpse bride on the front of the boat, the long arms from the jail cells, and, most notably, the "Don't let them bury me. I'm not dead." scene. Seeing this movie again brought all of these images back, cementing The Serpent and the Rainbow as a movie which has truly striking imagery, the type of which came from the mind of a man who was truly in touch with what nightmares are all about. Does the second half of the movie make any sense? Oh God no. The movie steps back into the reality of Alan's original quest every now and then, but by the finale where a psycho battle with a ghost takes place, we are squarely in horror territory. But, that doesn't really matter, does it? If you can let go of the fact that this is not a biography of Wade Davis and embrace it as a Wes Craven film, you'll find a lot to like in The Serpent and the Rainbow. And even if you don't like it, you'll have to admit that the images are amazing. 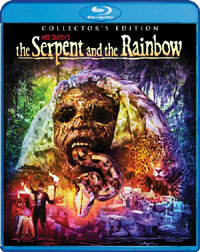 The Serpent and the Rainbow reminds us once again that we don't want to visit Haiti on Blu-ray Disc courtesy of Shout! Factory. The film has been letterboxed at 1.85:1 and the Disc contains an AVC 1080p HD transfer which runs at an average of 34 Mbps. The image is sharp and clear, showing only trace amounts of grain and no defects from the source materials. The colors look good, but the image is somewhat dark at times. The image is rarely soft, but the depth doesn't compare with some other older films of this nature which have appeared on Blu-ray Disc. The Disc carries a DTS-HD Master Audio 2.0 track which runs at 48 kHz and an average of 2.0 Mbps. The track provides clear dialogue and sound effects. The stereo effects are good, as are some of the bass effects. The "big" scenes deliver very scant surround sound effects, but these do add some presence to the scenes. The Serpent and the Rainbow Blu-ray Disc contains a handful of extra features. We begin with an AUDIO COMMENTARY from Bill Pullman. "The Making of The Serpent and the Rainbow" (24 minutes) is an odd featurette, due to how the participants are involved. We get an on-camera interview with Cinematographer John Lindley who recounts his memories from the film's production. Pullman offers comments by audio only over clips from the film. Author Wade Davis chimes in with his thought...via webcam. These three talk about the story and the locations, as well as the challenges of making the film in Haiti. We then get on-camera interviews with Special Effects Make-up Artists Lance Anderson and Dave Anderson, who give us detailed descriptions of how certain gags were done. We get a THEATRICAL TRAILER, a TV SPOT, and a PHOTO GALLERY to round out the extras.